This paper aims at briefly explaining graphic journalism and distinguishing it from comics journalism, as well as approaching graphic journalism via looking at the concept of interactivity. The second part discusses the case studies of The Nisoor Square Shooting (2010) and Ferguson Firsthand (2015) created by Dan Archer. It analyses and interprets how the two pieces of graphic journalism create new ways of storytelling, what their innovative elements are, to what extent interactivity occurs and which functions it fulfils. The case studies are chosen due to the fact that they can both be classified as graphic journalism. They work with a variety of different graphic media (e.g. photographs, maps, infographics, videos etc. ), but also consist of parts exclusively created as comics journalism. 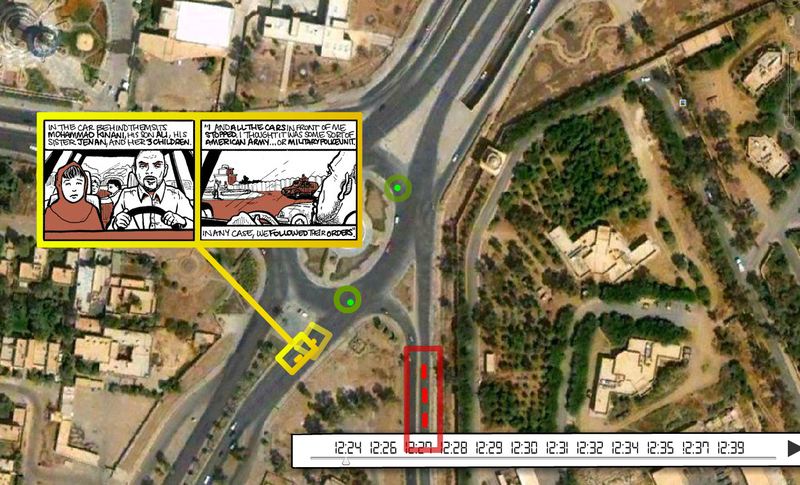 With The Nisoor Square Shooting (NSS) (2013) by Dan Archer,1 we encounter a piece of art that can also be classified as web-comics journalism. It includes an interactive timeline, available on the internet, which narrates panel-by-panel, and thus minute-by-minute, what happened during the 15-minute bloodbath at the Nisoor Square in Bagdad in 2013. Opinions differ whether NSS also belongs to a transmedial storyworld, or whether it is just the same story re-told in another medium.2 Compared to this, the case study Ferguson Firsthand (FF) (2015), which Dan Archer created two years later, is also a piece of web-comics journalism but with three major differences from the other piece. First, it uses virtual reality, which adds a new dimension to the field of graphic journalism in such that the recipient immerses into Michael Brown’s crime scene from the very beginning. Second, by wearing an Oculus Rift,3 the mechanics behind FF are based on a game engine and create a game-like environment around the Ferguson shooting scene reminiscent of playing a video game with forensic material. And third, the comics journalism is embedded within the storyworld. 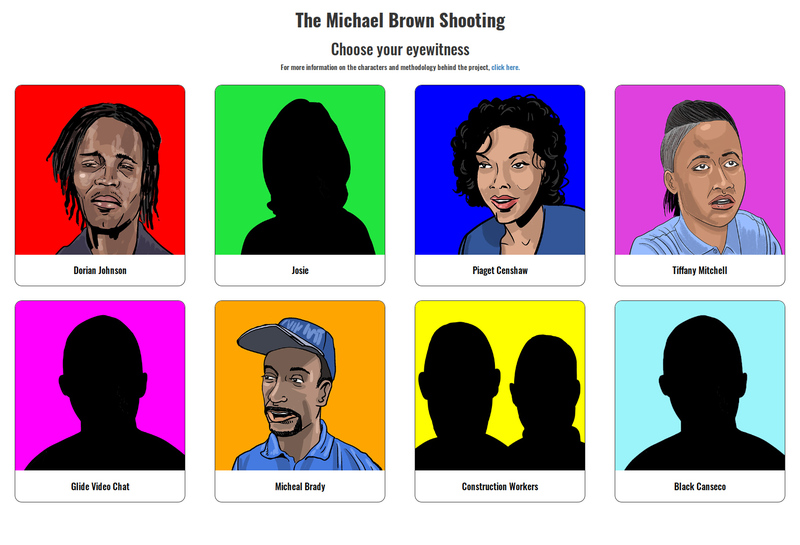 Each of the eight eyewitnesses of Michael Brown’s murder receives a storyline, drawn entirely in comics style, in which s/he reports her/his impressions and testimonies. What NSS and FF have in common is that they are pieces of graphic journalism creating a new way of storytelling by using the means of technology in order to produce innovative elements for narrating the plot. This goes far beyond the capabilities of ‘conventional’ journalism. However, the cases do not only tell the narrative but also force the recipient to activate him/herself, because both pieces use the concept of interactivity, even if to different degrees. Hence, the aim of this paper is to find out how the two case studies create new ways of storytelling, what their innovative elements are, to what extent interactivity occurs and which function they fulfil. Before examining the case studies, I would like to introduce the difference between comics journalism (CJ) and graphic journalism (GJ). These are ways of journalistic storytelling that are not as widespread in the anglophone community and therefore require an explanation. Moreover, I will briefly elaborate on transmediality in combination with comics journalism, as this will be especially relevant in the context of FF as well as for the concept of interactivity. According to American literary scholar Hillary Chute, graphic journalism stands in the long tradition of ‘drawing to tell’ and is ‘a genre both old and new’ as well as ‘a practice’.4 Both graphic journalism and comics journalism tell their stories with pictures and texts, particularly in the form of caption boxes and speech balloons, yet they are not interchangeable.5 The shortest way to define comics journalism6 is to understand it as a synthesis of graphic narratives and journalistic techniques regarding the research and production process. 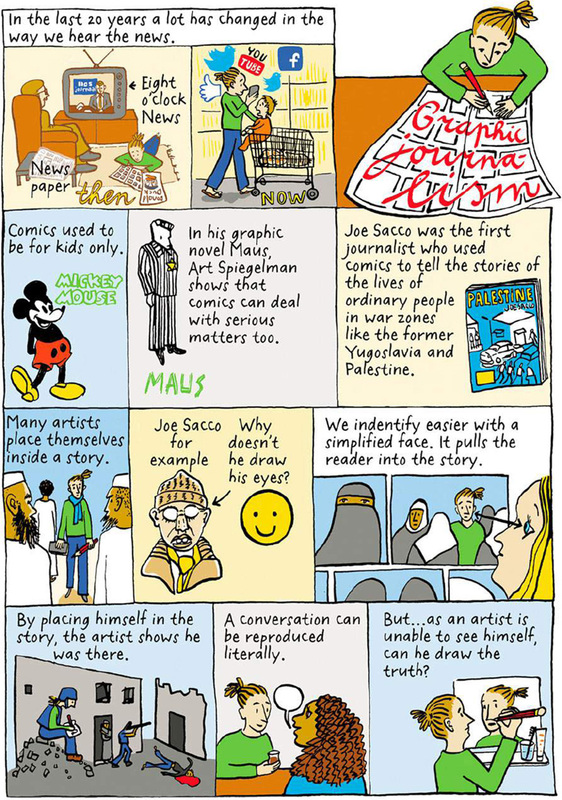 It is a generally acclaimed fact among comics scholars that the genre of comics journalism has been mainly influenced and shaped by the works of Joe Sacco, who is best known for his serious comics reportages Palestine (1996), or Safe Area Goražde (2000), where he describes the Israeli-Palestinian relations. Figure 1. 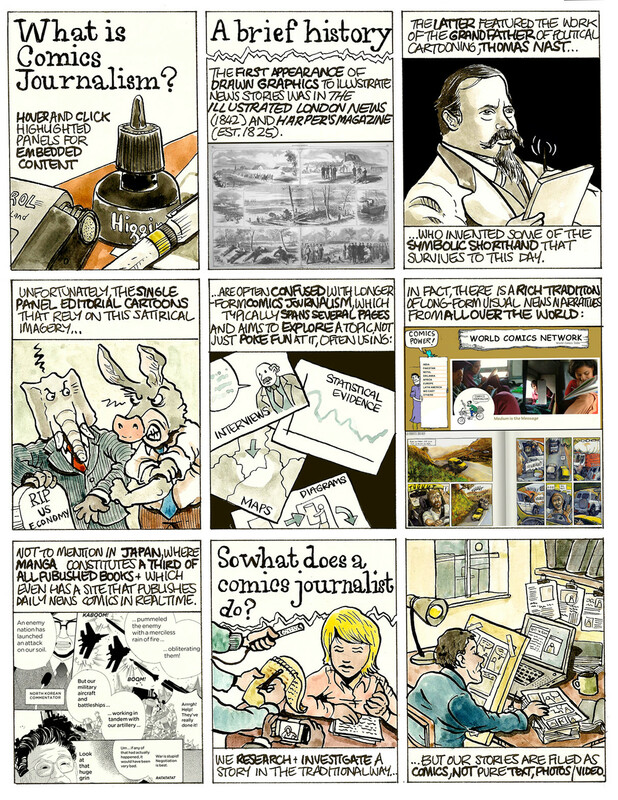 ‘Meta-Graphic Journalism by Eva Hilhorst, Drawing the Times (2014), panel block 1, (click on the green arrow on the right edge of the website to unfold the piece), with kind permission of the author. When applying the concept of interactivity to storytelling and narratology, the meaning of the term seems to be ambiguous. In many digital forms, the actions of users influence the evolution of the storyline. The narrative is not predetermined, which provides the element of entertainment for the user. As game designer Chris Crawford argues, ‘[I]t mandates choice for the user. Every interactive application must give its user a reasonable amount of choice. No choice, no interactivity. This is not a rule of thumb; it is an absolute, uncompromising principle.’11 However, in the context of journalism studies, The Oxford Dictionary of Journalism is more precise with its statement that ‘journalism in the digital age [allows] instant feedback from audience members to journalists and also directly to other members of the audience’ because of ‘the submission of user-generated content […], invitations to participate in online polls, the use of crowdsourcing to generate material for informative graphics […], and giving website users the power to decide in what order or format they wish material to be displayed’.12 In addition, reporters and audiences now often interact with each other via social media as buttons direct the user immediately to social networking sites, e.g. Facebook, Twitter or Instagram. These channels are frequently used by creators of (visual) digital journalism to spread content and meaning and arouse attention as well as curiosity for the story, which can also be found in the works of Dan Archer. Figure 3. A screenshot of the start screen of The Nisoor Square Shooting. After accessing NSS’s homepage, one encounters an aerial photograph of Nisoor Square, reminiscent of a satellite image from Google Earth. The viewer gets simple, short instructions on how to use the slider to move through the timeline. 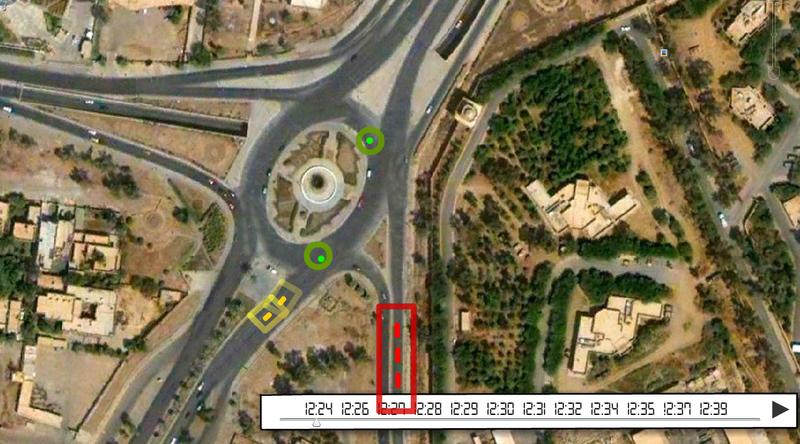 The scenic complexity is minimised and filled with the steady flashing of two different geometric forms, varying in size and connected to three different colours: a green circle symbolises Iraq police officials, a yellow rectangle indicates several civilian cars and a larger red rectangle represents the Blackwater guards. Figure 4. A screenshot of the event at 12:24 p.m. Figure 5. A screenshot of NSS at 12:24 p.m. from the perspective of Iraq police officials. Figure 6. 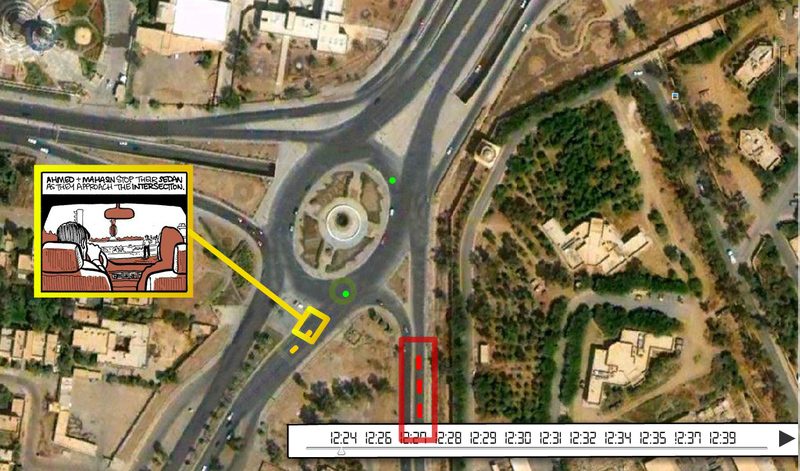 A screenshot of NSS at 12:24 p.m. from the perspective of Iraq police officials II. Figure 7. A screenshot of the event from civilians’ perspectives. Figure 8. A screenshot of the event from civilians’ perspectives II. Figure 9. A screenshot of NSS at 12:24 p.m. from the Blackwater guards. 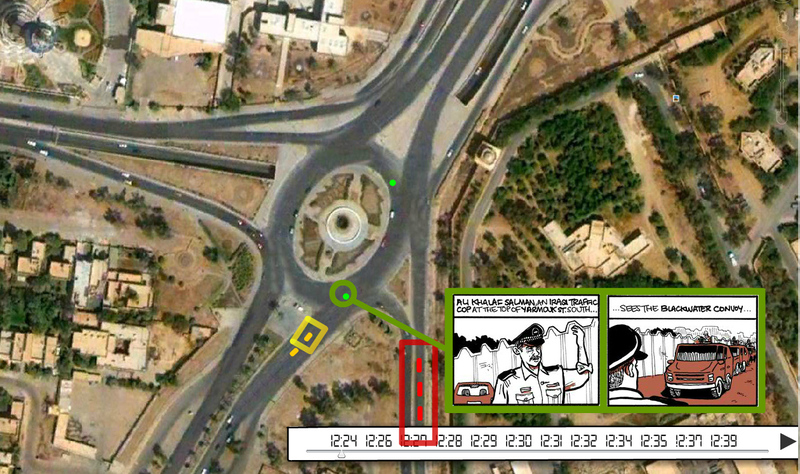 NSS promises to be an ‘interactive timeline comic’16; a timeline consisting of twelve different points of time from 12:24 until 12:39 on 16 September 2007 directs the viewer to the lower right side of the photo. This excerpt from the first plot at 12:24 p.m. of NSS shows that there are different characters simultaneously interacting in the diegetic world. At this specific moment in history, the events have naturally happened at the same time. In order to understand their messages fully, Archer slows down the process of narration by splitting the main plot into sequences. Each sequence consists of different panels that form the plot within each of the twelve pieces, or ‘frequencies’, of time. Hereby, it does not matter which geometric form (and therewith which character) to click on first, as all is happening at the same time. In other words, the recipient is free to choose any story s/he likes to read. It can therefore be concluded that the linear narration as a main feature of traditional storytelling has been broken up and no longer exists. What does that mean? The series of screenshots I arranged here is just one way of reading the first time-sequence. 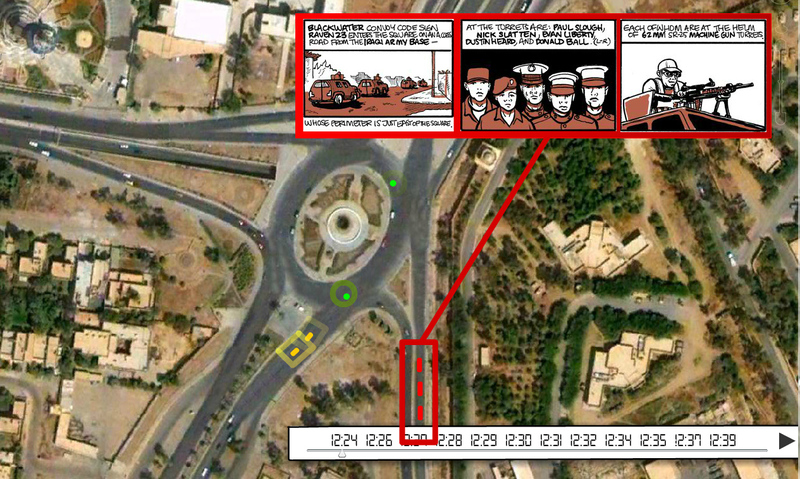 Theoretically, it is also possible to move along the timeline and only focus on the statements from one group, such as the Blackwater guards (red rectangle), before switching to the other eyewitness accounts. One could argue that this turns the event into a more personal and dynamic experience, because the spatio-temporal strength of comics is used here to play with the characters’ voices and allows the recipient to form his/her own opinion. Created five years after the NSS project, Ferguson Firsthand differs hugely in form, content and technical deployment on both the production side and the reception side, because it uses VR and is available as a desktop and android application. The full experience, however, runs only on the Unity game engine while using the Oculus Rift. 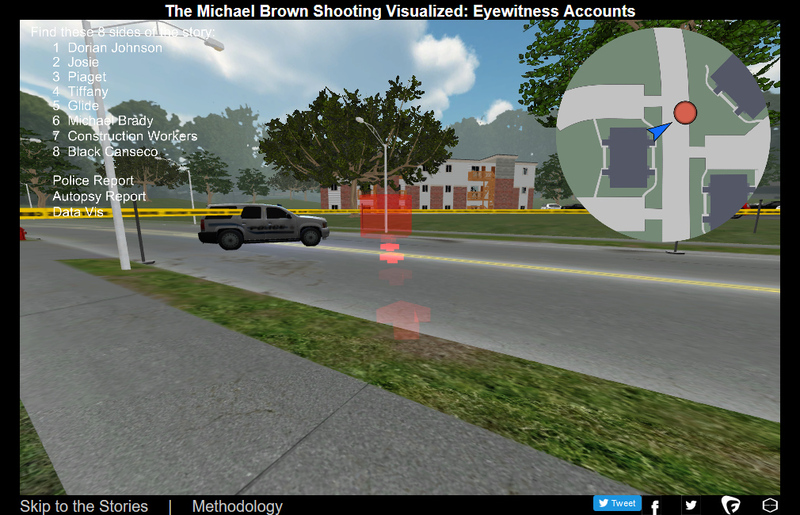 FF is a 3D forensic walkthrough that combines graphic journalism and comics journalism with virtual reality in order to recreate the crime scene of Michael Brown’s shooting. Michael Brown, an 18-year-old black man, was fatally shot on 9 August 2014 by white police officer Darren Wilson, 28, in Ferguson, Missouri, a northern suburb of St. Louis. Video 1: ‘Ferguson Firsthand VR: Explore the Canfield Green Apartments Scene‘, © all rights by Empathetic Media, 29 January 2016. Please visit the online version of the article to watch the video. The disputed circumstances of the shooting of the unarmed man received considerable attention in the United States and across the world. It sparked existing tensions in the majority-black city, attracted protesters from outside the region and generated vigorous debates about the relationship between law enforcement and African Americans and about police officers’ use of force in Missouri and nationwide. Brown’s death rapidly turned into a ‘media event’, not only receiving 24-hour news coverage, but also going across any type of (social) media. Based on eight eyewitness’ accounts of Michael Brown’s death given to media outlets such as CNN and NBC, as well as other evidence and documentation (e.g. photographs, videos, police reports, grand jury verdicts), this piece allows the user to compare and contrast these differing eyewitness reports to see ‘how each incident has given rise to such a wide range of perspectives’ of the incident.17 Even if there are a variety of different media outlets reconstructing the shooting,18 it is comics journalism that builds the main media element in the storyworld. This is due to its quantitative and qualitative importance to the plot,19 because each eyewitness account in its own unique way delivers the plot from multiple perspectives. 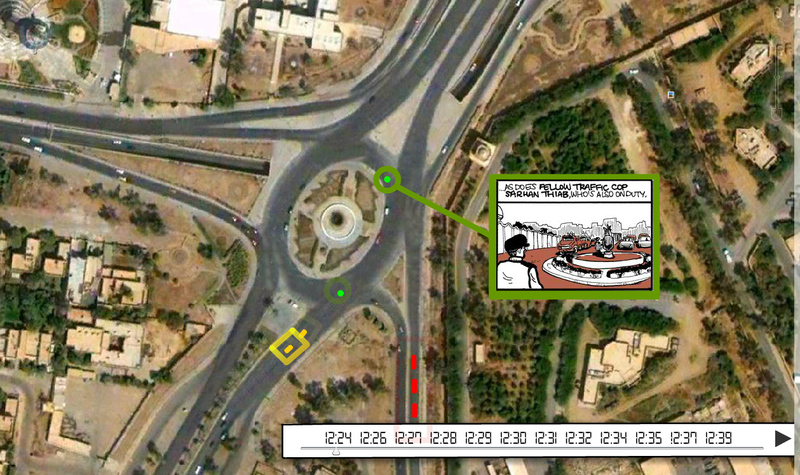 Also, in order to make the Ferguson-shooting as widely accessible among society as possible (even for those people who do not have VR experience or, accordingly, technical possibilities), all graphic narratives exist independently.20 Consequently, the narration can be understood by bypassing the virtual reality experience, even if the complete virtual reality experience only works on desktop computers. Figure 10. The drawn avatars of the eyewitnesses. Aroused by wearing the Oculus Rift, a VR headset, the recipient is put into the storyworld from the very first moment onward. Once inside, the user can either use the mouse to control where s/he looks or the cursor keys to move in that direction. The landscape of the storyworld and the Canfield Green Apartments, of course, are alike.21 In FF, the user cannot create an avatar or profile of him/herself. S/he is depicted as a blue arrow whose moves within the storyworld can only be followed on the map from a bird’s eye perspective. This allows for a feeling of distance from the subject of investigation. I argue that this distance is essential in order to fulfil journalistic claims, such as having minimal contact with the subject at hand in order to provide a neutral and objective report with regard to multiple perspectives. Figure 11. A screenshot of the home screen of Ferguson Firsthand. Similar to the intentional meaning of the use of colours in NSS, there are again three different colours of beacons: black stands for audio material, white represents forensic evidence and coloured beacons are for the graphic narratives. Following the arrows and walking into a beacon will activate a story, which one can read through panel by panel. Black and white beacons can be visited at any time, whereas the coloured ones are linked chronologically to guide the user through the area, starting with the most important eyewitness testimony. In the fifteen panels, one can see the crime scene and the events as observed by Tiffany Mitchell. She was standing at the corner of her house, which was one of the closest to the crime scene. In her narrative, Mitchell describes how she noticed two boys standing very close to the police car and a police officer who was trying to pull one of the boys in the car. Immediately after that, she heard a gunshot and got out the way. More shots followed. Panel 9 depicts a person, namely Michael Brown, starting to run away from the car, but the police officer follows him while shooting. By this time, the boy is already hit and turns around with his hands up, but the police officer ‘continues to walk up on him and shoot him until he goes all the way down’ (Mitchell, panel 14). Figure 12. 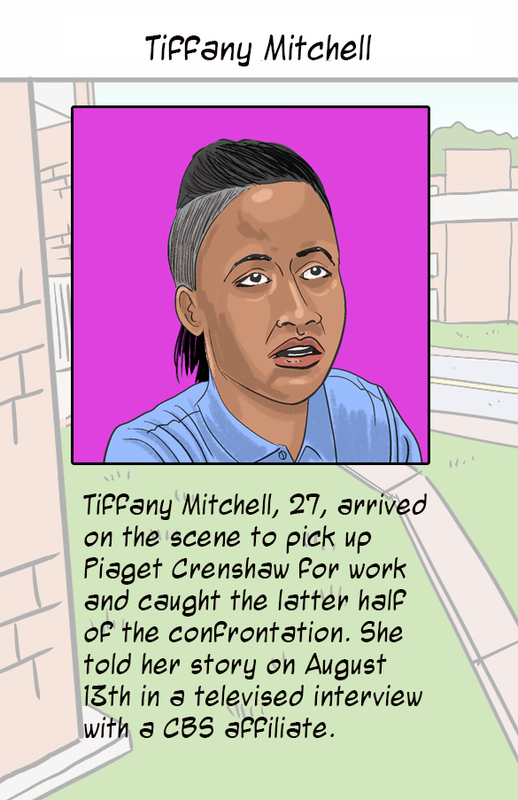 The first panel of the story told by the eyewitness Tiffany Mitchell. Similar to NSS, Archer makes his methodology of the production process transparent, which is more important because of the non-fiction context and journalistic claim of being trustworthy and using reliable sources.25 Yet, even if many textual and pictorial contributions enrich the content with additional perspectives, an increasing range of digital information also requires more contextualisation, classification and background information.26 The question remains as to how one can prove the trustworthiness and reliability of these sources. This, indeed, is a difficult question to answer, which cannot be answered here. Nevertheless, I agree with the comics journalism scholar Lukas Plank who argues elsewhere that transparency is the new objectivity in graphic journalism and can be inserted differently and varies among comics journalists.27 The insertion of or hyperlinking to other media material, and thereby the disclosure of sources, authenticates the value of the content presented as well as the working process and producers’ reliability. Archer has referred to ‘an interactive comic with content underneath it’28 in the context of NSS. With that, Archer refers to the sources other media, such as TV channels and radio stations, have used for their news coverage. 7 What’s in a Name? – The User as …?! What has become clear in NSS and FF is that the recipient’s role in the process of reading has changed. Even if the main narrative arc in the form of the minute-to-minute timeline-narrative sets the overarching reading frame in NSS, the reader decides which plot to follow first, where to go next, which content to skip and where to read further material. In FF, the user’s engagement even goes beyond mere choice-making since it is possible for the recipient to wear VR glasses and thus dive into a 3D-storyworld. Surprisingly, an academic discourse suggesting a satisfying description for the person at the other end of the medium in the context of non-fictional graphic journalism has not yet been developed.29 If you read a text, you are a reader. If you look at something, you are a viewer (and sometimes even an observer). So, what is in a name? What should people who play, watch, listen, read, explore, etc. on the internet be called in a non-fiction context? Of course, they do not necessarily do all of these things at the same time, and usually not all together, but to refer to them simply as ‘users’ seems to be too vague and simplistic put compared to the fact that a person who arbitrarily surfs the internet can also be referred to as a user. Based on the findings of case studies, it seems that the reader is no longer merely a recipient or reader; s/he can also be a consumer, user, detective, player or amateur journalist. Bernd Oswald uses the term ‘prosumer’ to describe this new user’s role(s).30 However, comics studies offer a term that perhaps better describes the ‘agency’ of a person using or operating a medium that requires the combination of many senses. In the context of web-based comics, Thierry Groensteen uses the term ‘readeragent’, a moniker I would also like to adopt here.31 It fits in well with the cases presented here, because reading and interacting become two different modes of attention. According to Groensteen, ‘[t]he reader no longer asks “What happens next” or “How is this story going to end”, but “What new actions will I be asked to perform?”’.32 It is for future research to prove whether Groensteen’s statements are true and to what extent the medial form influences the content in interactive non-fiction graphic journalism. Although the two case studies are situated within a non-fictional journalistic context, I draw on the concept of storytelling originating in a fictional context in literary studies. This is exactly what comics journalists, like traditional journalists, do: they tell stories to get their readers interested in topics. As Ansgar Nünning in the context of perspectivity in short texts once said, ‘But man […] is the story-telling animal’.33 In order to draw a line to storytelling and to define the more active engagement of the reader in FF, I would like to speak of a readeragent exploring the storyworld. This is an action of engagement that differs from that one in NSS, but it is also different from the rather high readeragent’s input in gaming, e.g. the requirements on the readeragent when playing video games. Besides the observation that the readeragent has to interact more actively, the question is now whether the degree of participation differs, if at all, between the case studies. To anticipate the answer, I argue that there are different levels of interactivity to observe. Whereas NSS can be classified as storytelling, FF reminds us once more of storyexploring and goes in the direction of storyplaying which, according to Domsch, is when things are played as games and read as narratives.34 This stems from a technical experimentation with virtual reality. Moreover, although NSS is labelled an ‘interactive comic’, the presence of interactivity is not as strong as it is in FF, for example. Based on the definition provided at the beginning of this paper, interactivity in NSS is present only insofar as the user needs to control the mouse or cursor keys to move the timeline and, therefore, to click and read through the fifteen minutes of narrated time in graphic narratives. As explained earlier, even if the user has somewhat of a choice in terms of freely deciding where to start reading a series of panels or what to read first (either the civilians’ statements or the perspectives of the other two parties in NSS), the readeragent’s possibilities are nevertheless limited in such that s/he can only choose between walking to different directions in the VR world. The behaviour of neither the user nor a VR member is influenced or activated (since there is no other character in FF at all), as the definition of interactivity in a narrow sense requires. In Marie-Laure Ryan’s words, one encounters an ‘external-explanatory interactivity’,35 or, as I suggest, a ‘light’ interactivity.36 In addition, the flashing of geometric symbols in NSS, which include hyperlinks and refer to existing audio material or newspaper articles (mostly from the New York Times or the Washington Post),37 also cannot be treated as interactive elements in the strict sense of direct computer-user-interaction. Another example illustrating ‘exploration’ rather than ‘interaction’ in the case studies can also be seen in FF. When accessing this piece of CJ for the first time, the reading of the coloured beacons follows the structure predefined by the media filter of the producers of FF. They decide which eyewitness report will be read first. For example, reading eyewitness report number six requires having read the other five reports chronologically, which, then, is symbolised with check marks on the map on the home screen. However, if one has played through the entire Ferguson-story and visited all the places and listened to each eyewitness account, one is able to revisit any place, replay any audio material or re-read the graphic narratives, thus breaking up the traditional linear narrative. 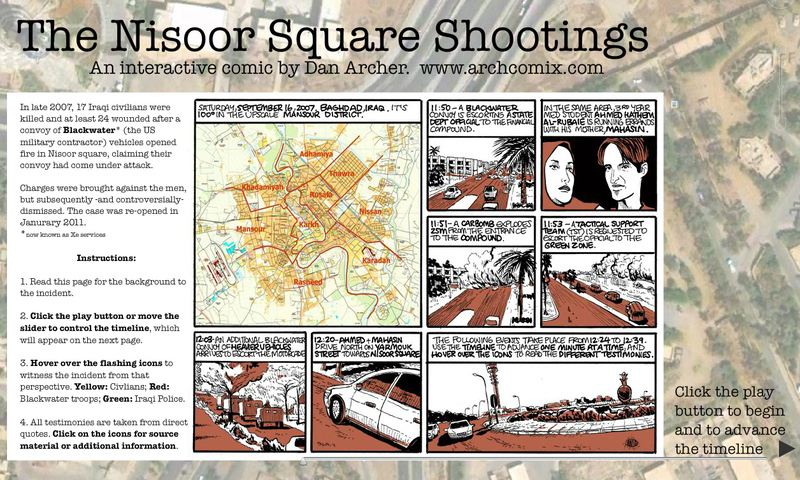 Whereas the first part of this paper was aimed at briefly explaining graphic journalism and distinguishing it from comics journalism, as well as approaching graphic journalism via a brief discussion of the concept of interactivity, the second part discusses the case studies of The Nisoor Square Shooting (2010) and Ferguson Firsthand (2015) created by Dan Archer. It analyses and interprets how the two pieces of graphic journalism create new ways of storytelling, what their innovative elements are, to what extent interactivity occurs and which functions it fulfils. It has been determined that GJ can appropriately be applied when different voices and perspectives need to be addressed so that the reader can make up his/her own mind. Visual storytelling draws readeragents into the story due to the compressed amount of information in a digital, a visual as well as an attractively structured form. Also noteworthy is the fact that the comics journalist behind both case studies, Dan Archer, can be regarded as a pioneer of this new type of web-graphic journalism. He is playing with technology and new digital ways of storytelling while at the same time pushing the borders of narratology, comics studies and non-fiction storytelling to their limits. It has been shown that web-graphic journalism has added levels of interactivity to the reception process. It is connected to the line of narration in such that the interactive elements break up the linear storytelling, such as how the recipient gets to choose where to go with the story first. However, the level of interactivity we face here is still restricted in basic features that cannot be compared to, for example, video game playing. This is why I speak of the occurrence of a light interactivity. It has been shown that interactive storytelling functions differently in the cases presented due to the fact that the users’ agency is used to different degrees of interactivity, travelling between the spectrums of mere storytelling towards storyplaying.38 I therefore suggest calling a light version of interactivity storyworld-exploring (my phrasing). The waiver of a strongly occurring interactivity is explainable with comics journalism’s purpose of record keeping. Compared to video games, the readeragent is not active. If this occurred, the state of facts within the storyworld could be in danger due to the recipient’s data-changing. However, to have the recipient slightly more engaged in issues and to still guarantee the trustworthiness of the production side, the virtual reality experience is included as a further step and as a new way of reading non-fiction. In FF, one encounters a game-like experience in a non-fictional journalistic context that is of an external-explanatory mode. In comparison, NSS is created as a time-line narrative covering fifteen minutes of time depicted in time-frequencies. Moreover, the different degrees of interactivity have led to the observation that both the name and the role of the user have been changed in non-fictional graphic journalism. For this reason, comic scholar Thierry Groensteen’s concept of a ‘readeragent’ has been adopted as a moniker to describe the new multitasking digital reader. Another point is that the visual and narrative qualities of graphic narratives have proven to be appropriate. For instance, the use of avatars in FF is able to protect the eyewitnesses’ personalities to a greater extent than, for example, traditional media broadcasting audio-visual interviews with subjects of the Brown crime scene. Additionally, after comparing all eyewitness reports, one discovers blank spaces that Archer tried to depict visually by drawing. The spaces within the gutter are reminiscent of the blank spaces of the eyewitness testimonies. Hence, it is up to the reader to fill the gaps with his/her imagination. Ultimately, what stays? What is the intention of graphic journalism in regard to interactivity? Is it to test out and play with new technological developments? Is it to reach a diverse readership? Is it to reach an interested audience, particularly of younger people, in a time of decreasing news consumers and where anybody with access to the internet can produce news? Or, is it the idea that consuming news should be fun and not coercive? Thus, should news be ‘playable’ in the future? This paper attempts to answer these questions, even if not fully; the objective is to show the influence of interactivity on graphic journalism, and hence comics journalism as well. It can be seen as an innovative storytelling format which is able to create and re-arrange socio-political, critical topics from a perspective other than ‘traditional media’, such as television or printed newspapers. Future research will prove that it is the concept of graphic journalism going across media and utilising each medium’s strength in combination with the latest trends in media technology that makes digital graphic journalism interesting for a broad and heterogeneous public. Moreover, more research must be conducted to determine the extent to which the concept of transmediality39 intersects with web-graphic journalism, because telling stories across multiple (visual) media formats has become very popular in digital journalism in recent years. No single medium remains capable of satisfying the curiosity and lifestyles of our citizens now that we are surrounded by an unprecedented world of content, products and leisure opportunities. It has always been great stories and articles that win hearts and minds: ‘We have faster and faster turnaround and shorter and shorter attention spans, and fast-food type stories. But that means it’s even more imperative to tell stories that have a strong emotional and intellectual impact […]’.40 Another desideratum I would like to address in this context is the lack of research on the influence of the form (‘how’) on the content (‘what’) in graphic journalism. Considering journalistic principles, if a ‘game-like’ experience is more attractive than decoding and exploring the content, one needs to be all the more careful and should adhere to moral rules and to journalism’s code of ethics in order to avoid a ‘gamification’ of journalistic content. To conclude, as the editors of Journalismus in der digitalen Moderne observe, the effect of the rise of digitalisation leads to a socio-cultural modernisation of contemporary societies (cf. Kramp et al. 2013: 8). To their mind, in the medium term, recipients will mainly receive journalistic contents in digital form via electronic devices such as tablets, iPads and smart phones41 (cf. Novy 2013: 27). Future studies will have to prove how far and to what extent graphic journalism as a new way of digital storytelling will lead to a socio-cultural modernisation of contemporary society and whether it will result in a revitalisation of the journalistic branch. However, the genre of graphic journalism, particularly comics journalism, has the potential to be effective as an alternative form of journalism for processing an amount of journalistic content. Laura Schlichting holds a Master’s Degree in English Literary and Cultural Studies at Justus Liebig University Giessen. Since October 2015, she has been working on her PhD: ‘Comics Journalism – (New) Journalism, New(s) Genre? !’ (working title). Laura Schlichting is a member of the International Graduate Centre for the Study of Culture (GCSC) as well as the International PhD Program (IPP). She is funded by Konrad Adenauer-Stiftung. In addition to graphic narratives and transmediality, her research interests include intermediality studies, genre development, photography and journalism.